I think that this was the second comic book I bought, but I’m not sure. It has the same cover date as Superman #180, but so does another comic I bought around the same time. I’m sure Superman #180 was the very first, but my memory of the specific sequence of acquisitions is a little dim after that. I feel like Batman followed right after Superman, however, and it also seems like the most appropriate choice — so that’s what I’m going with here. My memory is also trying to tell me that I was previously aware of Batman from commercials for his upcoming live-action series (maybe even one featuring the Batusi? ), but that seems pretty unlikely. The premiere of ABC’s “Batman” was still 5 months away, and I don’t believe that networks aired promos that far in advance in those days — but I could be wrong. Assuming there hadn’t been any such commercials, however, I must have had only a vague idea of who Batman was and what he was all about. Only a year later, Batman would be everywhere — toys, records, books, trading cards, other novelties, a movie — but in the summer of ’65 there were only the comics. One thing that didn’t change with the “New Look” was the inclusion of misleading creator credits. Due to his contractual arrangement with DC Comics, cartoonist Bob Kane was credited not only as the sole creator of the Batman character, but of all stories and art featuring the character, as well. (The inclusion of writer and artist credits for any comics stories was pretty much hit-and-miss in the mid-Sixties, but Schwartz’s other comics generally did provide them.) Due to the diligent efforts of later comics researchers, however, we now know that the lead story in Detective #344 was written by Gardner Fox, drawn by Sheldon Moldoff, and inked by Joe Giella. The villain that Batman faced in this, my first-ever Batman story? Not the Joker, Penguin, Catwoman, or any of the Caped Crusader’s other well-known costumed foes. “The Crime-Boss Who Was Always One Step Ahead of Batman!” was an ordinary-looking, if clever, gangster named Johnny Witts (get it?). Luckily, the villains would get more interesting in the next few Batman comics I picked up. 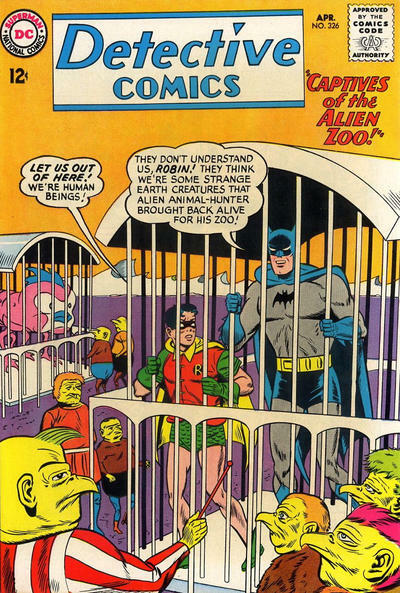 “Peril in Paris”, which found the Dibnys going up against a ring of jewel thieves in (duh) Paris, France, was the creative product of another trio of Julius Schwartz mainstays: writer John Broome, penciller Carmine Infantino, and inker Sid Greene, the first two of which had, with Schwartz, originally created the Elongated Man in 1960 as a recurring character in The Flash. 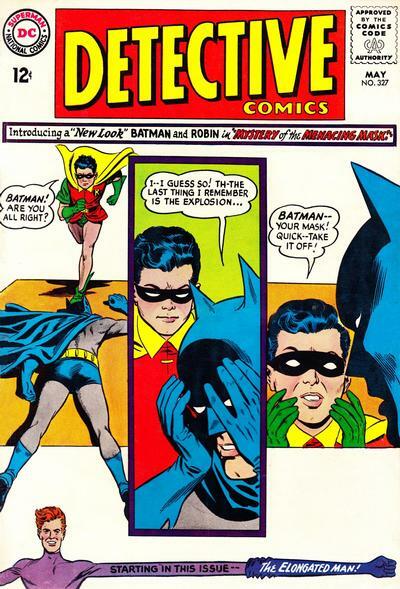 (Infantino also provided the Batman-featuring cover for this issue of Detective.) The plot of the story turned on an extraordinarily unlikely (OK, impossible) instance of two women’s minds being switched when one is hypnotized by a stage magician. In August, 1965, however, the story made less of an impression on me than did the art; Infantino’s style, typified by odd but somehow elegant figure poses, sparse backgrounds, and clear, fluid action, was the most appealing art I’d yet seen in comics. Infantino, along with two fellow artists from Schwartz’ stable whose work I’d come to know in the near future — Gil Kane and Murphy Anderson — would set my personal standard for “good art” in comic books for years to come. All in all, I’d say Detective Comics #344 was a pretty good value for twelve cents.